What Is the Function of the Anemometer? An anemometer is a tool that is used for measuring wind speed. It is a common part of most weather stations. The first anemometer was created by an Italian named Leon Battista Alberti who lived during the Renaissance period from 1404 to 1472. However, the most common type of anemometer was created by Dr. John Thomas Romney Robinson in 1846. It is called a cup anemometer. Anemometers are separated into two different types. Some are for measuring wind velocity and others are for measuring wind pressure. Wind pressure and velocity are related so closely that an anemometer that is designed for one purpose will give information for both. Meteorologists can use anemometers to help determine the strength of a storm. Other scientist and climatologists may also use anemometers for a variety of experiments in order to predict future storms or simply to plot a good place for a windmill. Most anemometers are coupled with other weather measuring tools. 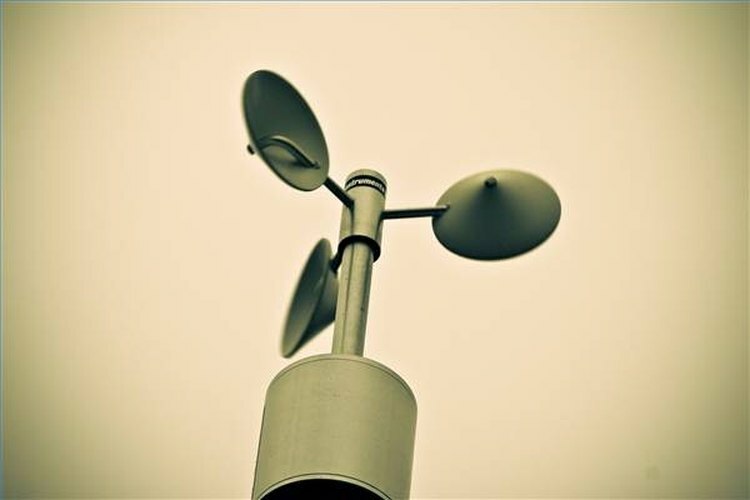 Some of the tools used with anemometers are wind socks or weather vanes, which are both used to determine wind direction. A simple anemometer can be created using nothing more than a piece of string attached to a ping-pong ball. These balls are very light and move in the wind. If you measure the angle of the ball being moved and compare it to the angle without wind, wind speed can be deduced. John Ross Crutchfield graduated from Georgia College and State University in Milledgeville, Georgia with a Bachelor's degree in English with a concentration in creative writing in 2005. Now, he lives in Marietta, Georgia.